asad shud concentrate on the economy and not get involved in this kind of stuff. Cant trust our media jo baat ka batangarh banaty h.
If that’s the case Fawad should apologize instead of explaining in press conference. 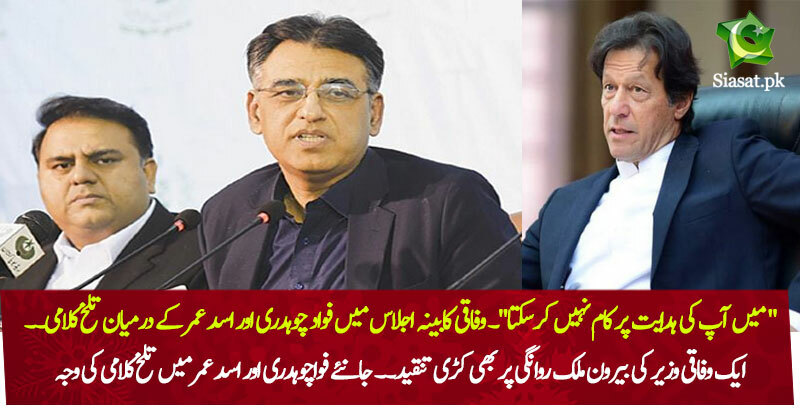 Asad Umer is the most imp after IK, Fawad and all others should pay respect to Asad Umer. Asad Omar seems to have a lot of time on his hands. Bhai, why are you doing press conferences and telling others how to do media. You're the economy minister and economy is in the gutter. Do your job and let others do theirs. Asad show some performance in economy your work should speak for you but unfortunately all we get is speeches in press conferences and interviews in news channels. What can an information minister deliver ? Manage ptv and radio pakistan...and there is no issue if 2 people have different opinions in a meeting. Arguments on a topic or decision has nothing to do with delivery. As long as they fought for something to make Pakistan better. Otherwise, fire them both.